Why Should We Re-balance Portfolios? Not all sectors of the market move in tandem. Sometimes one sector (small cap domestic for example) might languish for a quarter or two while another (emerging market for example) might do extremely well. The fourth quarter of 2014 saw the MSCI Japan Index fall approximately 3% (see security EWJ in the graph below). At the same time, the Russell Midcap Value Index rose approximately 6 1/2% (see security IWS in the graph below). By taking some profits from the out-performers like IWS off the table, and allocating those funds to under-performing sectors like EWJ, one is able to maintain diversification and balance within the portfolio. It also forces one to "sell high/buy low" in relative performance. Take a look at what happened to the same securities in the following quarter. EWJ rose over 11% while IWS rose almost 2%. 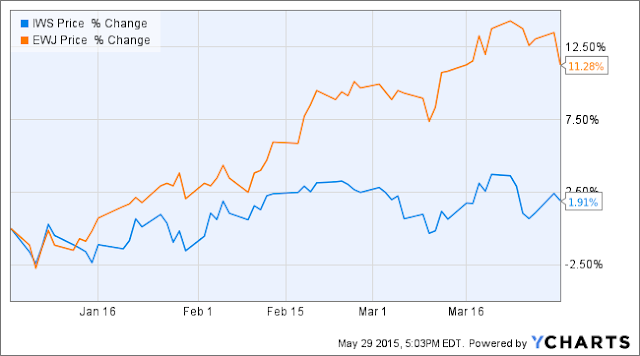 In other words, EWJ outperformed IWS significantly in the first quarter of 2015. 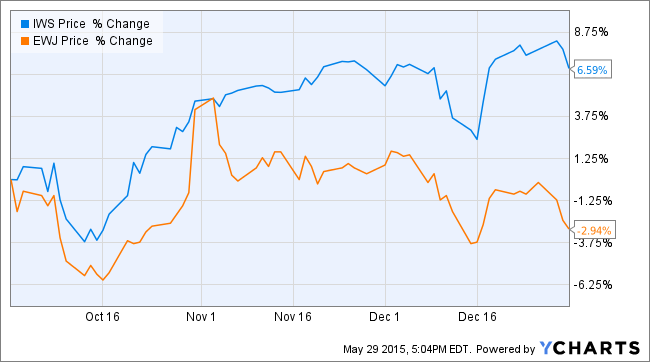 See the graph below for the first quarter 2015 performance of these two securities. By taking some profits off the table and allocating them towards underperforming sectors, an investor could have achieved better yields than if he or she simply held the securities. Also, by rebalancing, one maintains the originally intended asset allocation one desires. If a person wants 60% domestic equities and 40% international, and if domestic equities fall while international rise, then one's asset allocation towards international has become overweighted. Most people do not want an "all the eggs in one basket" type scenario in their portfolio. Good money managers watch asset allocation and rebalance when necessary. Those managing their own portfolios can do it too. Keep an eye on ratios within your portfolio and don't get stuck overweighted in one security or one sector. Core consumer-price index figures were released this morning and showed the largest increase in over two years. Core CPI showed a 0.3% increase in April which is the single largest gain since January, 2013. This figure moves us closer to the Fed's goal of 2% inflation, at which point the Fed will be considering their first interest rate hike since 2006. Stock futures fell slightly on the news while bond yields rose. Again, we encourage retirees (and really anyone) with bond portfolios to take an in-depth look at the makeup of their bond investments. What is the average maturity? How low are your coupons? What do the individual credits look like? If you own funds or ETFs, the same questions apply. Some bonds will fall slightly when rates rise, others will fall dramatically. Make sure you know how your portfolio will react and make sure you take the appropriate steps you need to take to minimize your surprises.